On 20 October 2013, President Uhuru Kenyatta led Kenya in celebrations of the first Mashujaa (Heroes) Day since his election. Mashujaa Day honours Kenya’s heroes who fought for independence from colonialism, and is thus in many respects synonymous with the struggle for sovereignty. This year’s Mashujaa Day coincided with the celebration of 50 years of Kenya’s independence. At the same time, Kenyatta’s trial at the International Criminal Court (ICC) for crimes against humanity began in earnest this year, and he is expected to appear in court on 12 November 2013. It is thus in the context of the Mashujaa celebrations, Kenya’s 50th independence anniversary and the legacy of his late father and Kenya’s first president, Jomo Kenyatta, that Kenyatta faces the dilemma of whether or not to humble himself and appear before the ICC for trial. In Kenya, and Africa in general, the ICC has been depicted as an instrument of ‘neocolonialism’ that has no regard for the independence and sovereignty of Kenya and, by extension, Africa. 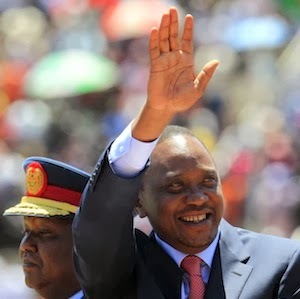 Will Kenyatta betray the spirit and ideals of Mashujaa, the ethos of 50 years of independence and the legacy of his late father, and submit to this ‘neocolonialist’ court or stand firm, as a modern-day shujaa, in defence of sovereignty and in defiance of the ICC? His decision will have significant political ramifications in Kenya, Africa and internationally. It will reflect his views on the rule of law and impunity. Moreover, it has the potential for casting Kenyatta as either a hero or a villain. Like any other mortal, Kenyatta must be anxious over the prospect of standing trial for crimes against humanity, and not just because of the nature and gravity of the alleged crimes. He will also be aware that this is the first time in the history of international criminal justice that a serving president will be put on trial before the entire world. However, Kenyatta seems unshaken at public occasions, at which he has indicated that he believes he has nothing to fear and that he will be vindicated in the fullness of time. There is no doubt that, despite Kenya’s legal commitment to the Rome Statute, Kenyatta could be tempted to harden his anti-ICC position given the collective anti-ICC narrative that has lately characterised deliberations at the African Union (AU) and the Kenyan parliament. This narrative casts the ICC as a political ogre, which the president cannot confront alone but which must be faced on a collective platform and with a united national and regional voice. Following the ICC’s indictment of the president and his deputy William Ruto came the political rallying against the ICC, depicting the court as a tool of neocolonialism. This notion culminated in the Kenyan parliament’s adoption of a motion to withdraw from the Rome Statute. The withdrawal process is currently being formalised. Then came the shuttle diplomacy to lobby select African heads of state to support the anti-ICC position adopted by the AU. This was followed by some African leaders threatening mass withdrawal of African states from the Rome Statute should the United Nations (UN) Security Council fail to defer the Kenyan cases. Lately, there have been increasing public calls in Kenya for the president to ignore and defy the ICC, as well as threats to physically stop him from attending proceedings in The Hague. The public calls, which mostly originate from Central Kenya and the Rift Valley – political strongholds of the president and his deputy – have found their way to the corridors of justice through two court cases. However, in dismissing one case before the Nairobi High Court, the judge ruled that the argument that there would be a constitutional crisis and power vacuum in Kenya in the event of Kenyatta and Ruto attending the ICC trial was speculative and hypothetical. A similar case, which is yet to be determined, was presented before the High Court in Nakuru. Clearly, political interests in Kenya and at the AU regarding the ICC have crystallised. The AU seems bound by the desire to shield its members from international criminal justice. Undoubtedly, Kenyatta’s political survival hinges on his ability to please his constituents. Similarly, his survival in the region depends on his ability to demonstrate loyalty to the AU brotherhood. The political pressure in Kenya and at the AU to defy the ICC seems to have pushed Kenyatta into a corner. At the same time, the president is keen to build on his legacy as an international statesman who abhors impunity, which began when the legitimacy of his election as president was questioned. He championed respect for the rule of law and its institutions as the basis for resolving the election dispute. Kenyans, with the support of the international community, heeded this call and avoided a repeat of the 2007 post-election violence. The dilemma for the president lies in the political pressure he faces at the AU and in Kenya to defy the ICC, on the one hand, and his need to demonstrate international statesmanship through respect for the rule of law, on the other. The situation is further complicated by the fact that his deputy is currently attending the ICC trial despite the aforementioned political pressure. While it seems politically astute for the president to bow to political pressure from the AU and at home, in the absence of a UN Security Council decision on deferral he should be guided by his conscience on what is good for humanity and the need to build a strong legacy, within and outside Kenya, for respect for the rule of law. Becoming an ICC fugitive like President Omar al-Bashir of Sudan will not augur well for the president’s international reputation or legacy.